Students and employers meet in a "reverse career fair" in USF Sarasota-Manatee's Selby Auditorium Nov. 8. Ben Heins, USFSM’s Coordinator of Internships & Service Learning, left, talks to Bart Stucker, Coordinator of Orientation & Recreation Programs, speak outside the reverse career fair. Vernice Gumbs-Crunk is making a career change. After two decades as a call center manager, the 49-year-old native of St. Thomas in the U.S. Virgin Islands is doing an internship at Sarasota-based Informa in their payables department. The University of South Florida Sarasota-Manatee senior says the last few years at her job weren’t a lot of fun – something she’s experiencing at her new position. University Beat report on the USF Sarasota-Manatee reverse career fair. Gumbs-Crunk and some of her classmates recently got some career help by taking part in something never seen before in the USF System: a “reverse career fair,” where students didn’t line up, résumés in hand, begging for a moment of a potential employers’ time. Instead, the employers came to them. 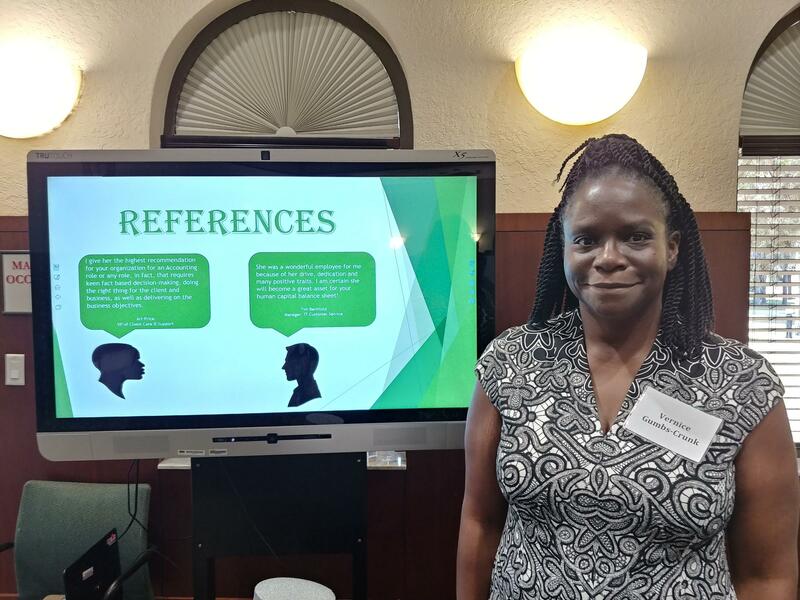 Vernice Gumbs-Crunk and her high-tech résumé were on display at the USFSM reverse career fair. “There were several people that approached me and said, ‘I specifically checked you off because I knew you were an accounting student and I wanted to speak to you,’ and that’s great to hear, it gooses your morale and your confidence,” said Gumbs-Crunk. Students did put on a bit of a show for those employers. 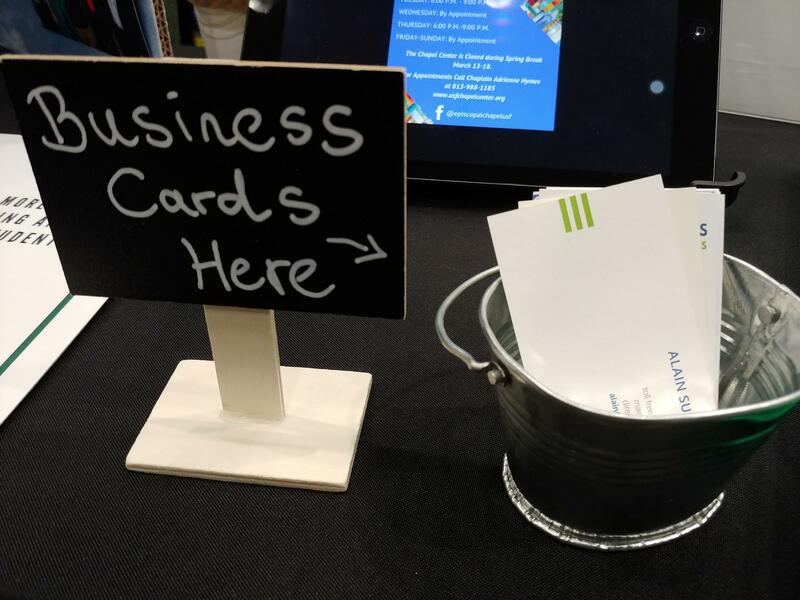 Instead of that dry résumé, they put together displays showing off their work, both academically and professionally, and maybe even some personal information – think a science fair booth, but with the student as the main exhibit. 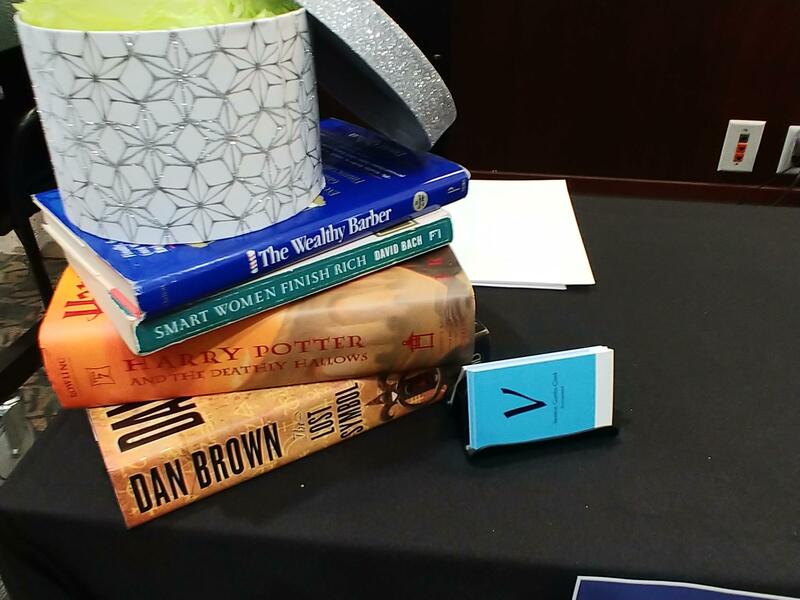 Gumbs-Crunk's display showed off some of her interests: home-baked cookies and books she loves. Gumbs-Crunk went for a combination of low-tech delicious and high-tech entertaining: while she handed out cookies she made, she also used a 40-inch monitor to show off a brightly designed power point résumé describing experience and her interests. “If you notice some cartoon characters, I love the superhero movies, I wanted to bring that out and have them see I have a humorous side to me,” she said. Marketing senior Lukas Oest’s display also showed off a personal touch: photos telling the story of the 21-year-old’s journey from Germany to USFSM, where he serves as director of marketing for the Student Government Association. Almost 60 students – ranging from freshmen to recent graduates – applied for the fair back in August. After an interview process, half of them were chosen to take part. But first, they had to go through training sessions, focusing on such things as résumé development, networking and how to handle a job interview. By picking the students in advance, organizers knew which type of businesses to invite. “So that everyone in the room has at least an employer or three there that are happy to talk with them,” said Heins. In addition, all the employers had to have positions available – either paying jobs or internships. “You go to a traditional job fair and some employers that are present will only hand out anonymous cards to students, where there’s no name, there’s just maybe a contact email on it, maybe a phone number, and it’s a generalized approach to what should be a very personal approach,” he said. Juan Arcila is with UnidosNow, a non-profit Sarasota organization that serves Hispanic students. He was looking for potential employees and interns, and said the reverse career fair was a different way to get to know students. “I am so impressed with everything that I am seeing, they’re prepared, they’re engaged, and it doesn’t look like it’s a rehearsed speech, they’re very natural, so this is a skillset that they’re going to take even after they graduate from college,” he said. 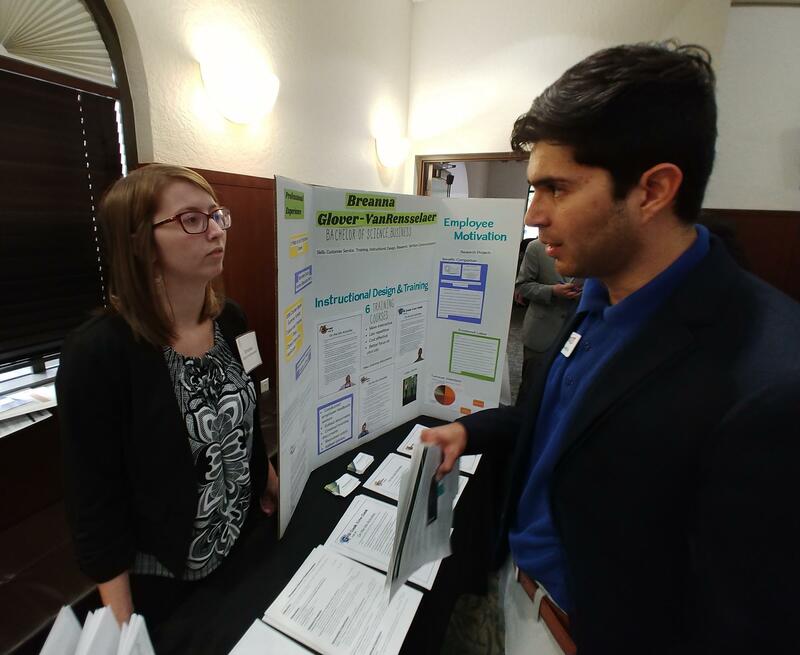 Recent USFSM graduate Breanna Glover-VanRensselaer, left, speaks to Juan Arcila of Sarasota-based non-profit, UnidosNow. Arcila graduated from USF Tampa, but found something different about USFSM. “I like this small, intimate atmosphere and I feel that’s what USFSM can really provide because, in Tampa, it’s a fantastic campus, I love it, but a lot of times I felt lost, and what I like about USFSM is that it has opened up an opportunity to engage each student individually,” he said. One of the students Arcila met with was Breanna Glover-VanRensselaer, who graduated in May with a business degree but is now looking for a career in instructional design. 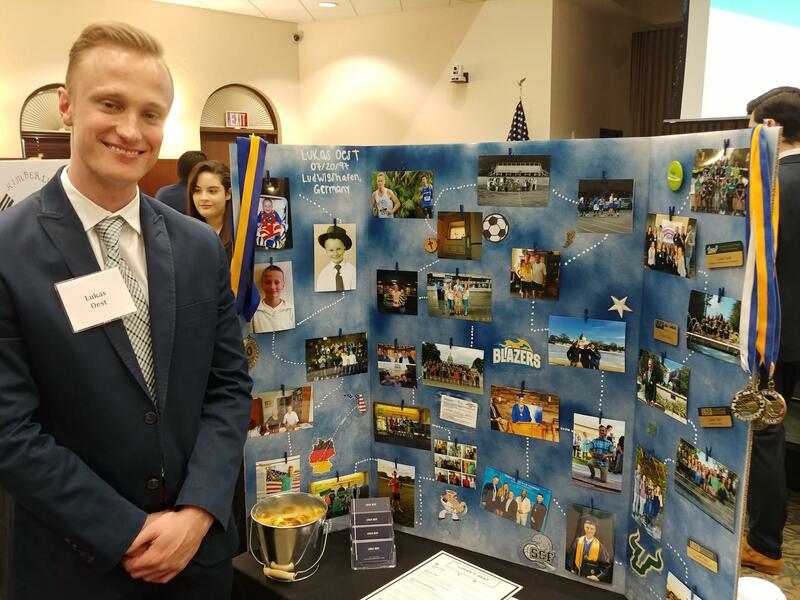 USFSM marketing senior Lukas Oest's display showed off photos of his journey from his youth in Germany to his move to the U.S. to his becoming the first in his family to graduate from college. Oest found the event to be less stressful than a “regular” career fair. "A lot of times what tends to happen when you’re at a regular job fair is there’s so many students, they all have the same goal, they’re all trying to talk to that particular employer and find employment,” he said. “Before I would stand in line to talk to the employer and I felt that they were rushed because they were trying to handle as many people as they wanted to, and at the same time, I wasn’t sure if I was what they were looking for,” she said. And it may just pay off for her in her search for a new career – Gumbs-Crunk confirmed an interview about an accounting position with one company and is close to lining up one with another business. One USFSM student found a polite way to ask potential employers for their information. The University of South Florida Muma College of Business is home to a new laboratory that doesn’t consist of beakers and microscopes. Instead, it’s a high-tech virtual lab where students are learning the latest techniques in the fast-evolving, fast-growing world of cybersecurity. About 200 Tampa veterans and military spouses gathered at the Ragan Community Center in Tampa today. They met with potential employers at Hiring Our Heroes, a job fair hosted by the U.S. Chamber of Commerce, as they searched for opportunities to transition back to civilian life. Jorge Hoyos is a reservist with the U.S. Air Force. He's held contracting jobs in the past, but is now looking for a job with more stability, and an opportunity for growth. The University of South Florida wrapped up its third and final town hall last week to discuss consolidating the separate accreditations of its three campuses.